Bangles and Glitter and Raver Candy! People can identify you as a cute little Raver by the things you adorn your body with. Whistle – The Raver mating call! Pacifier – accentuates the “kid” in “candykid”. Bonus points if it has LED lights built in! Large assortment of colored and glittery bracelets – as a raver, you are required to sparkle! Lollipops, nerds, and other colorful, high sugar candies that you ate as a kid. Who needs drugs to get high when you can overdose on SUGAR?? TRUE raver candy. 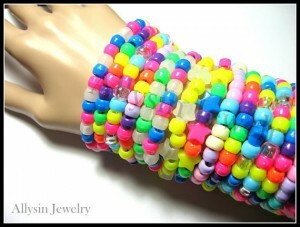 In fact, go for a 2-for-1 hit and get literal raver candy bracelets! Ravers love glitter. Sparkly things attract their attention very easily, especially when on ecstasy!